A lot of people are saying City Hall is in shambles. Don't believe them. 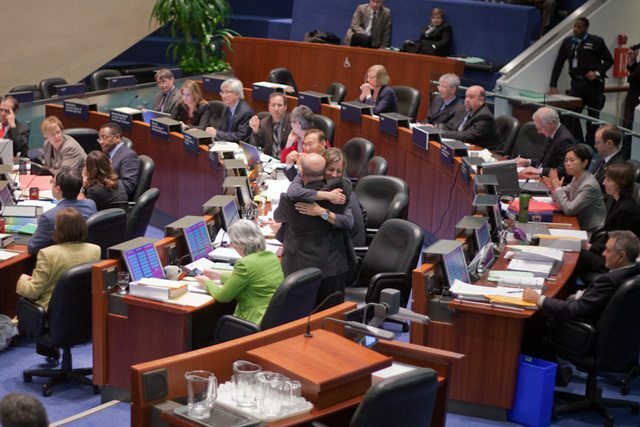 Karen Stintz and Peter Milczyn hug it out on the floor of council, while their colleagues decide which of them will be the new chair of the TTC. Yesterday’s vote on the composition of the TTC board was Rob Ford’s single best opportunity to turn the tide and break up the coalition that has been forming to oppose him on key issues over the past nine months. Because the vote involved handing out plum assignments to councillors—many of whom have personal ambitions or strong policy interest in the TTC, many more of whom wanted to sit on the board than there were seats available—the chance that they’d fragment and that Ford would be able to take advantage of internal tensions, playing them against each other, was at its highest. The story many people are writing today is about a mayoralty adrift, a powerless, rudderless leader who lost control of the most important municipal policy file a year into office and hasn’t gained it back—which is to say, no leader at all. That story is true, but there’s another corresponding one that is just as important: the one about a self-governing group of politicians who nobody thought would get along, whose numbers have grown, who have banded together consistently over the past months to stake out and defend positions, who have done so at some risk to their careers, and who show no sign of backing down. It’s the story of a maturing municipal government that is coming into its own. To take the measure of the chaos on the mayor’s side and the unity in much of council, we need only look at the result of yesterday’s vote [PDF]. Councillors were asked to choose seven individuals to serve as TTC board members, from the 11 who had been nominated and accepted the nomination. (Three were nominated and declined.) Out of the mess of Xs on the voting sheet, a pattern emerges: 21 councillors listed exactly the same seven names. Two more listed six of those seven names, and three more listed five of them. Those are the councillors who were installed as the new commissioners of the TTC. Twenty-six councillors—strange bedfellows, many of them—got together on the future of the TTC board, maintained that consensus through a day of messy debate, and renewed their commitment to rational transit planning. 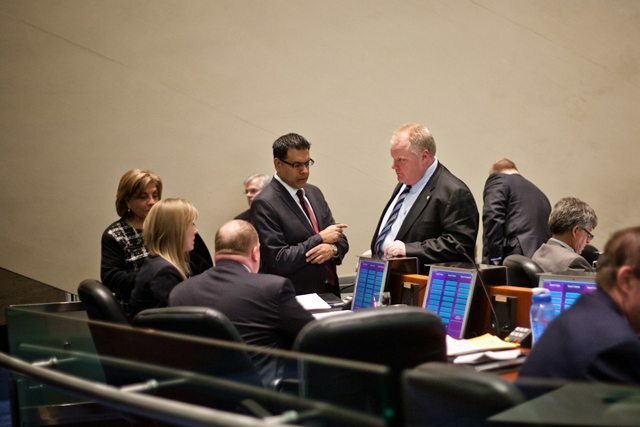 Rob Ford consulting with his staff and councillor Frances Nunziata during yesterday's debate. Toronto doesn’t have a mayor who can successfully steer major initiatives through council—that much has been made clear. Rob Ford cannot deliver. But we have a council that can. And that is why, for all that yesterday’s debate was messy and often ridiculous, for all that there were a lot of deals cut behind closed doors to keep the coalition together, and for all that keeping such a coalition together will require continued political wrangling, we are optimistic. We have a government that is working. It is making decisions based on evidence, and it is defending those decisions over time. It is a government that has set a direction on the most fraught and most important policy file we have. It is a government that is doing its job even though Rob Ford isn’t doing his, and if it keeps on doing so Toronto may come out of this mayoralty in better shape than many of us had feared. One telling aspect of the newly installed TTC board: there are no downtown councillors on it. But it’s not because they were shut out—quite the opposite. Every single downtown councillor backed in majority or in entirety the roster of candidates who won yesterday’s vote. For months we’ve been hearing that transit is downtown-centric, that downtown councillors want to ram their vision for public transit down the throats of suburbia, that downtown Toronto is selfish and blinkered and doesn’t care about regions of the city that have been left behind. You know how you wind up with a TTC board that has no downtown councillors? They agree, every single one, not to run. They trust that other councillors will represent their interests. You find them in the centre of a much bigger coalition, in other words, in which decisions are made together. Rob Ford, by contrast, is utterly lost. The once dominant mayor who commanded votes with ease and had a group of allies in apparent lockstep couldn’t get those allies to agree on just about anything yesterday. Many of the councillors who back Ford didn’t even fill out all seven spots on their ballot (Deputy Mayor Doug Holyday only used three of his seven votes), so frustrated were they by the list of candidates. They had no coherent voting pattern, and no slate of their own candidates to put forward. Even for a new mayor with a clear electoral win, getting a majority of councillors (in the absence of a party system) to agree on anything is difficult; we used to measure Rob Ford’s power by how effectively he did this. He no longer does. But that doesn’t mean that no decisions are being made, and no agreements have been reached. They are, and they have, and the credit doesn’t go to any one person. It goes to approximately 26 of them. The law tells us that council is supreme, that it determines policy for the city and sets the direction of government. Recent events tell us that council is up to the challenge.